Coleman Pack-Away Outdoor Kitchen Just $47.20! Down From $115! PLUS FREE Shipping! You are here: Home / Great Deals / Amazon Deals / Coleman Pack-Away Outdoor Kitchen Just $47.20! Down From $115! PLUS FREE Shipping! Head over to Amazon where you can score Coleman Pack-Away Outdoor Kitchen for just $47.20 down from $114.99 PLUS FREE shipping! 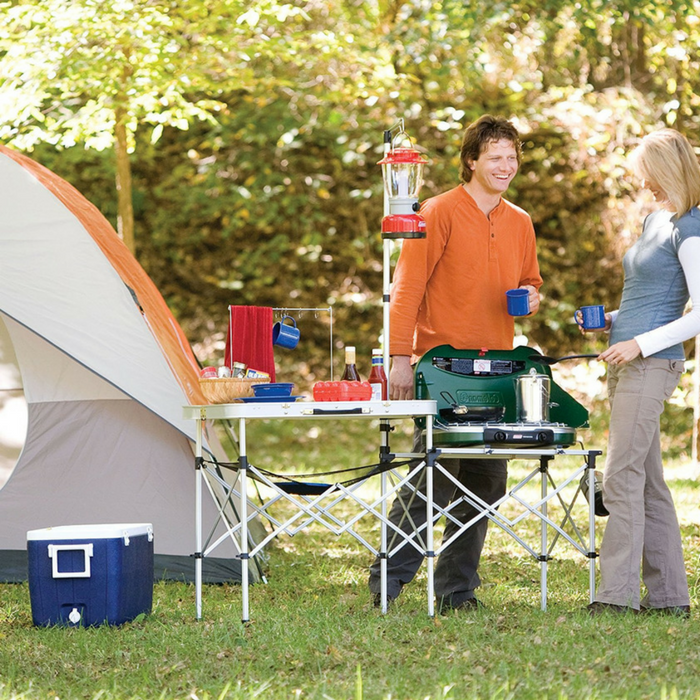 Cooking in the great outdoors just got easier with the Coleman Pack-Away Kitchen. The full-size expanding aluminum frame and snap-on surfaces make setting up easy. The side stand adjusts to fit most Coleman stoves and coolers, while a separate food prep surface allows ample space for slicing meat and vegetables. A lantern hook provides a convenient place to hang your light for cooking at night. You’ll get plenty of room to store utensils and extra ingredients or supplies with the hanging hooks and a mesh shelf. When the fun is done, the whole setup packs into a single integrated storage system for easy, compact, one-handed carrying. Awesome!